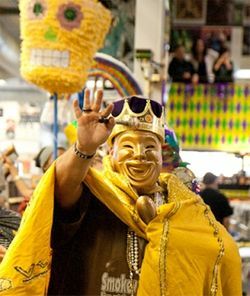 On Tuesday, February 17 the aisles of Amoeba Hollywood swelled once more with homemade floats, revelers, and the merry strains of our volunteer brass band as we ushered in our annual Mardi Gras celebration. We kicked things off at 3pm with some tunes from DJ Humble B, followed by a boisterous parade through the store and onto Sunset Blvd., closing the party out with a mix from our own Mr. Ray. 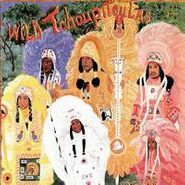 Employees and customers alike donned strands of beads and colorful masks for one of the biggest turnouts we’ve had in all the years we’ve been celebrating Fat Tuesday. Although the event originally started at Amoeba San Francisco in 1998 as a celebration of our employees’ hard work in between the busy holiday and summer seasons, the focus of Amoeba’s Mardi Gras celebrations turned towards outward giving in the years following Hurricane Katrina. A portion of Fat Tuesday’s sales from all three stores and Amoeba.com went to two New Orleans charities benefiting the city’s storied music community: Tipitina’s Foundation and the New Orleans Musicians’ Clinic. Tipitina’s Foundation strives to preserve and advocate for New Orleans’ unique musical heritage, while also aiding the professional development of adult musicians and promoting childhood musical education through their Instruments A Comin’ program, which provides new and refurbished musical instruments to school band programs in the area. Tipitina’s also provides after-school internship opportunities for high school students, in the form of an after-school jazz band, where they receive training in music theory, instrumental performance, recording, and career professionalism.